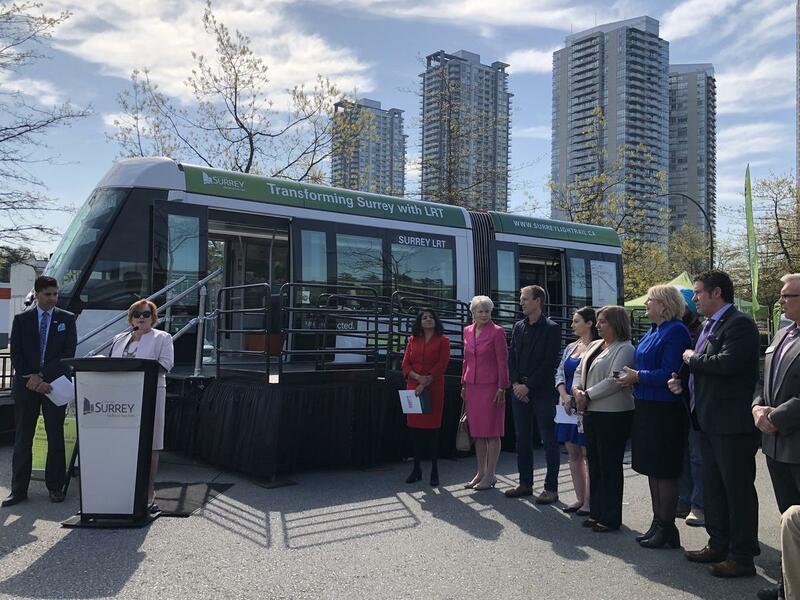 Numerous community and business leaders joined Mayor Linda Hepner today to launch an 8-week LRT showcase, offering residents a first glimpse at Surrey’s future LRT. 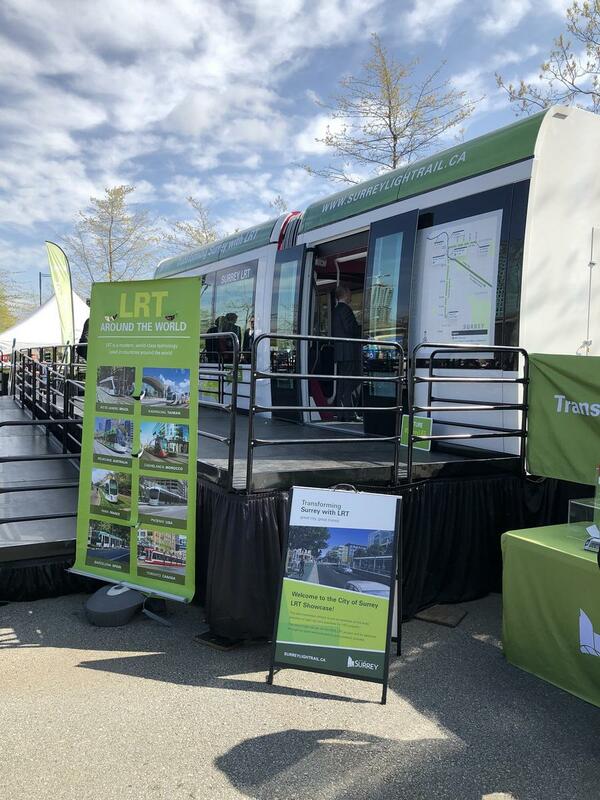 As part of the showcase, a prototype LRT train car has been brought in from Europe and put on display in the Central City parking lot next to King George Blvd. It will remain there for the next couple of weeks before being relocated to Newton Town Centre, Guildford Town Centre, and finally the Surrey Canada Day celebration in Cloverdale. The goal of the showcase is to give residents a first-hand look at what the urban-style LRT train will look like. 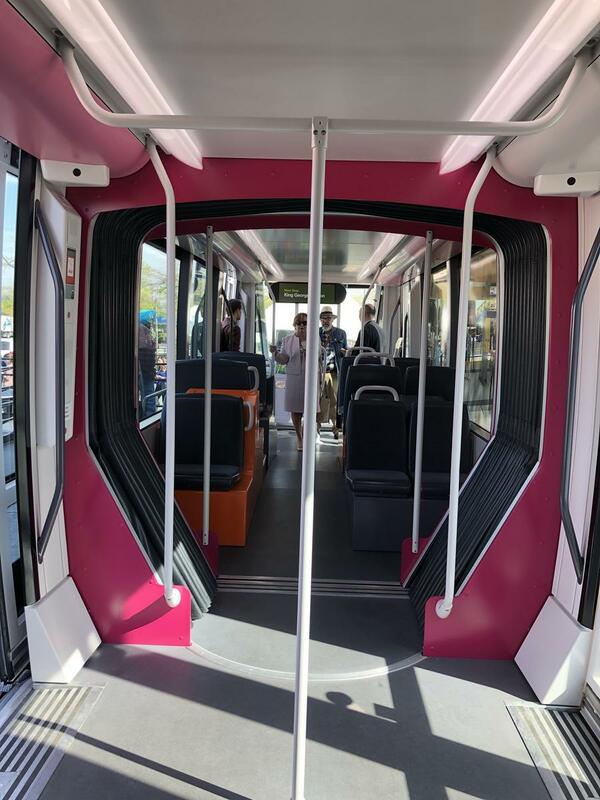 Unlike high-floor commuter-type LRT trains like those in Calgary and Edmonton, Surrey’s LRT will be low-floored, similar to those found in many cities throughout Europe, and even Toronto. Despite being more integrated with the urban environment, the trains will nonetheless run on a dedicated right-of-way, apart from traffic, offering significant improvement over a bus – not only in speed, but also through more consistent/reliable schedules, frequency, capacity, boarding doors, and comfort. It is important to point out that the particular train car brought in for display is just a prototype, and the actual trains chosen for the Surrey line, will likely look a bit different. LRT was chosen as the mode of choice for rapid transit in Surrey following years of study that began as far back as 2010. Numerous options, and combinations were looked at including LRT, SkyTrain, and Bus Rapid Transit. The results found LRT to be the most cost effective system for Surrey – with 27km of LRT track (2 lines) able to be built for the same $2.2 billion price tag as 16km of SkyTrain (1 line). 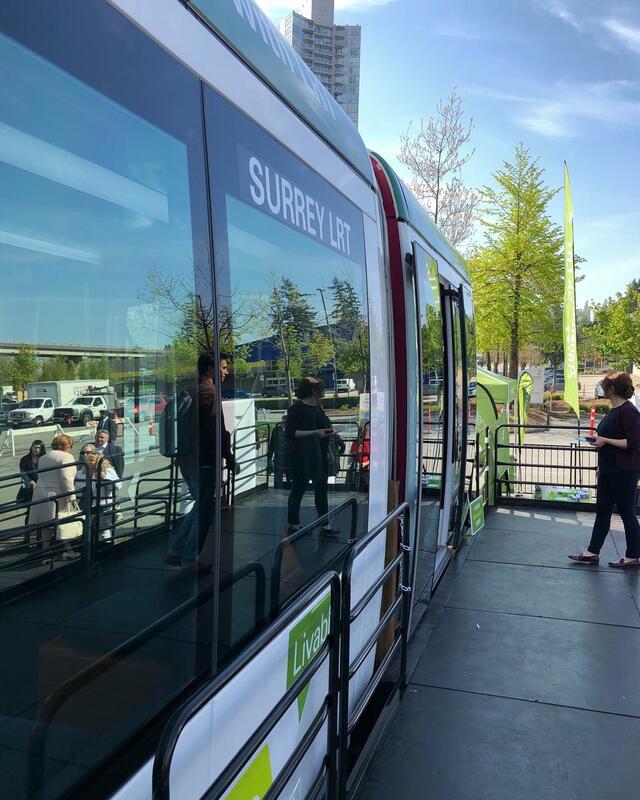 Surrey gets a more extensive rail transit network, better integrated with the community, creating more pedestrian-orientated streetscapes, with LRT. Further, operating costs for LRT were found to be $6 million cheaper annually, with negligible differences in travel times. Since securing funding back in March, the first phase of Surrey’s LRT network – the Guildford-City Centre-Newton line – is now on track to begin construction by late 2019 and be in service by 2024.